Thank you for attending the 2012 ASMBS Foundation Annual Event! The 2012 Celebration of Excellence live musical entertainment was provided by Haute Chile. Casino games were provided by Casino Magic Parties, LLC. Each year, the Foundation honors an American Society for Metabolic and Bariatric Surgery (ASMBS) member who has displayed a selfless commitment to the ASMBS and has made significant contributions to the field of metabolic and bariatric surgery. 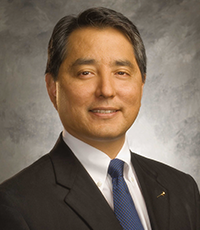 Dr. Kelvin Higa has been involved in the leadership of the ASMBS serving as President of the Society as well as its Foundation. As one of the first surgeons to perform the Roux-en-Y gastric bypass with a hand-sewn anastomosis laparoscopically, this proved to be both a cost-effective and efficient solution to the escalating costs of the surgical procedure. Dr. Higa serves on the editorial board of several peer reviewed journals and has authored articles concerning the complications and long-term results of bariatric/metabolic surgery. He is a Clinical Professor of Surgery through UCSF and is active teaching and mentoring residents and fellows while continuing to lecture at many national and international meetings. Dr. Higa’s main interest continues to be in exploring the boundaries of minimally invasive techniques applied to complex surgical problems, such as revisional surgery. Dr. Higa currently serves as Director of Bariatric and Minimally Invasive Surgery at the Fresno Heart and Surgical Hospital and CEO of Advanced Laparoscopic Surgery Associates, Medical Group. The award will be presented at the annual ASMBS Foundation Event titled, “Celebration of Excellence in Bariatric Surgery” on Thursday, June 21, 2012 during the 29th ASMBS Annual Meeting in San Diego, California.